Finally, a chance to put some FUN into your next FUNdraiser! Is your group looking for a fundraiser that is fun, healthy, safe, profitable and HASSLE-FREE? 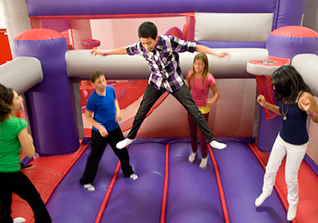 BounceU offers a FUNdraising opportunity for your organization that will meet these needs. Request a weeknight (Monday-Friday) event for your non-profit organization. Three week’s advance notice required. Non-profit organizations must have over 15 participants and directly benefit children’s causes up to the age of 12. We supply great tools to make your event a success. We will provide a half page flyer for you to print through email to distribute.